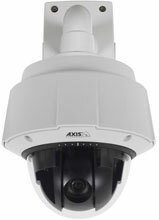 The Axis Q6034-E PTZ Network Dome has been discontinued. No direct replacement is available. For the highest video quality and performance, Axis Q6034-E PTZ Network Dome is the choice. Designed for the most demanding applications, the outdoor-ready PTZ dome provides HDTV coverage of large areas, great details when zooming in, and high-speed pan/tilt performance. 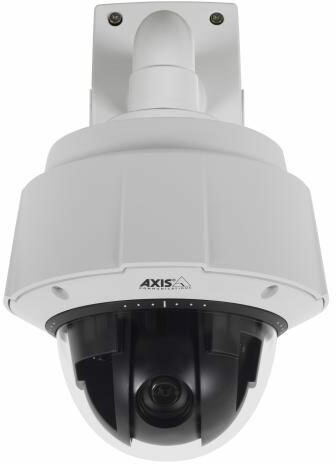 Axis Q6034-E PTZ Network Dome provides 18x optical and 12x digital zoom with autofocus. Due to its HDTV resolution, the camera's 18x zoom provides not only a level of detail that is comparable to a 36x-zoom, 4CIF camera, but also the extra advantage of a wider, 16: 9 field of view. The camera also has a fast and precise pan/tilt response at 450 degrees per second. It can tilt 20 degrees above the horizon, enabling better views, especially over uneven terrain. With Active Gatekeeper, the camera can automatically move to a preset position upon motion detection in a pre-defined area, and track the detected object.